1. It is very important for the health and welfare of bees to grow the right type of flowering plants favoured by bees for pollen and honey gathering, throughout the summer months. I t doesn’t need to be complicated. At this time of the year Angelica and red clover are definite favourites. Bumble bees are always on the look out for disused mice tracks in the soil. That’s where it likes to build its nest for the queen. 2. Red currants, raspberries, blueberries and blackberries are now beginning to ripen. Late-picked gooseberries are sweeter than the ones picked in June. 3. Support heavily cropping branches of plums, apples and pears. However, overcropping will greatly reduce next year’s crop. To reduce the threat of the silver leaf fungus entering via broken branches of too heavy-cropping plum trees , drastically reduce the number of fruits now and space the fruits 6 inches apart, leaving the best sized fruits. 4. Space the apples six inches apart, after the middle of July. 5. Check weeds around trees and bushes. Tie in the newly-forming shoots of loganberries, blackberries and tayberries. 6. Tie in the replacement shoots of peaches. Check the fruit cage for holes in the netting. Birds are good at finding the holes and eating your cherries, redcurrants, blueberries and raspberries. 7. Check tree ties. Too many trees are severely damaged due to ingrowing ties. 8. Place the pheromone traps to reduce the damage caused by caterpillars of the codling moth and plum sawfly now. 9. All fruits need a steady supply of moisture. Check the soil. If too dry, apply water at 10 day intervals. 10. If apple and pear shoots are growing too strongly, remove the growing tips of the new growth. Carry out summer pruning where trees are becoming too dense and light is excluded. 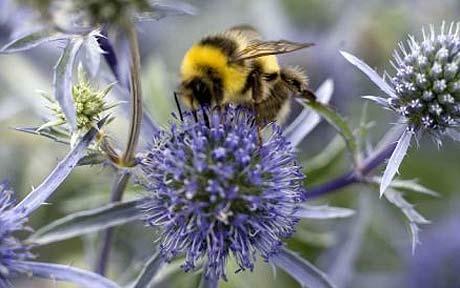 We will be looking to increase the bee population, steadily the grass will give over to flowers!